You’ll need a long and sunny growing season for a successful cantaloupe harvest but the flavor of your fruit crop is worth taking a chance. Some varieties mature faster than others, so even shorter growing seasons can accommodate some cantaloupes (try EarliChamp or EarliGold). Cantaloupes are also known as “muskmelons” or “rockmelons”. After the seeds are scooped out, the orange flesh is very sweet and high in vitamins A and C, as well as potassium. It’s almost always eaten raw. 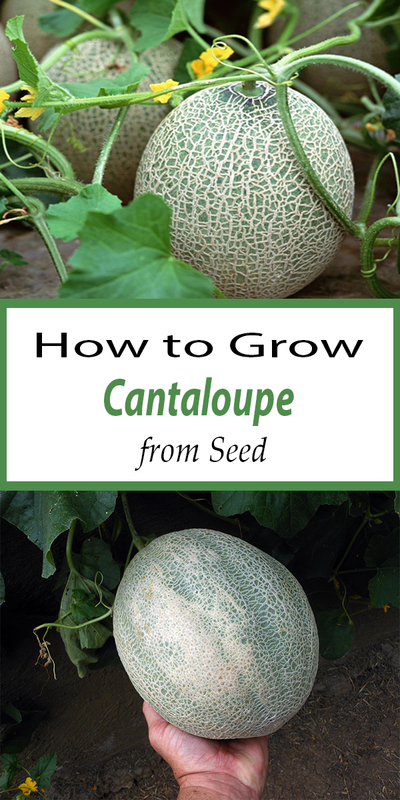 Start your cantaloupe seeds around 3 to 4 weeks before your last frost date. Sow your seeds about an inch deep in your potting soil. Cantaloupe plants are very sensitive to transplanting, so you should start your seeds in paper or peat cups that can be planted all in one piece rather than try to dislodge the seedling from a plastic pot. When planting, tear the bottom of the cup out so the growing roots will have no obstructions at all. When you water your cantaloupes, keep the water down at the roots and soil. Adding water over the leaves can increase the chances of disease and fungus infection. Keep your seedlings well watered, especially when they start to develop their melons. Unlike most other plants, after the fruit begins to grow, you should actually cut back on the water. This helps to concentrate the sugars in the fruit, making for sweeter melons. Let your plants dry out just until you can detect a bit of wilt, or when the soil is dry to the touch. Fertilize regularly, with monthly applications of standard fertilizer mix. Fruit that is growing down on the ground can be protected from early rot or other pests if you place something solid under them to keep them off the soil. Coffee can lids work well, and it keeps your fruit cleaner too. If you have a short growing season, you can help your plants focus on just a few fruit by picking off the flowers after your plants have started 3 or 4 melons. They will grow quicker if the vines aren’t also busy trying to make more. Pretty much any variety of cantaloupe can be grown in a container, and you can either let the vines spill over the sides or use a support. To make it easier, smaller plants (with smaller melons) will do better for container gardening. Minnesota Midget has 4″ fruits and is one of the better choices for pots. The bush is compact and the smaller melons won’t need as much support. Use a pot that’s at least 12″ across, or even a big 5 gallon pail. Various forms of wilt can harm your plants, and these diseases can live in the soil from one year to the next. So rotate your crops and don’t keep planting cantaloupes in the same place. You can’t treat for wilt, but many melon varieties have been developed that are resistant to it. Cantaloupes are related to the cucumber, and can be targeted by several of the same insect pests. Cucumber beetles have black with yellow stripes and can really devastate your plants by chewing the leaves. Pick them off when you see them, and treat your plants with a vegetable-safe insecticide. Same goes for squash vine borers, another insect that will eat the vine’s leaves and stalks. Powdery mildew is a common problem in any vegetable garden, and looks like a dusting of white powder on the leaves. Don’t let the leaves get wet when you water your plants, and treat them with fungicide as soon as you detect the problem. Melons need to ripen fully on the vine. They do not ripen well after they are harvested. Cantaloupes develop a wonderful fragrance when they are ready to pick – you can’t miss it. The fruit should slip easily from the vine and the blossom end should feel soft to the touch.